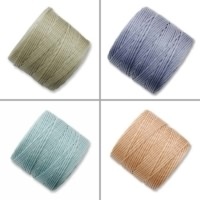 Super-Lon (or S-Lon) cord is a fine thread of twisted nylon fibers that feels wonderful in the hand and comes in vibrant colors, packaged as mixtures or as monochrome lengths. 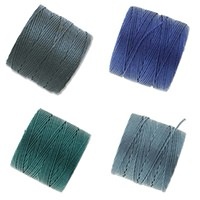 A perfect material for micro-macram�, bead stringing, finger-weaving, bead crochet and more, soft Super-Lon nylon cord is comparable to Conso, Mastex, and C-Lon cords. 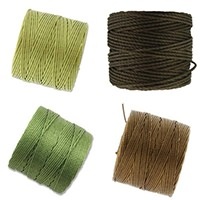 Colors: brown, khaki, copper, light brown. 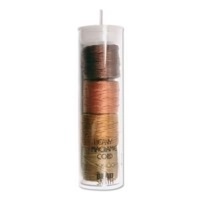 Superlon Bead Cord is a standard weight 3-ply twisted #18 bonded nylon multi-filament cording. Diameter is about 0.5mm. 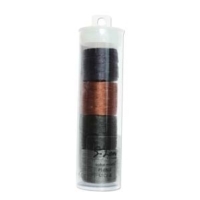 The color assortment contains 4 spools. Each spool is approximately 77 yards. Colors: capri blue, green, golden yellow, shanghai red. 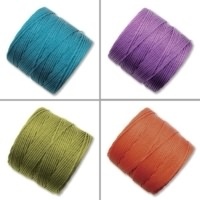 Superlon Bead Cord is a standard weight 3-ply twisted #18 bonded nylon multi-filament cording. Diameter is about 0.5mm. The color assortment contains 4 spools. Each spool is approximately 77 yards. 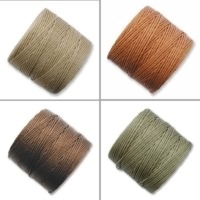 Colors: light brown, medium brown, dark brown, and natural. Superlon Heavy Bead Cord is a heavy weight 3-ply twisted #18 bonded nylon multi-filament cording. The cord diameter is approximately 0.9mm. 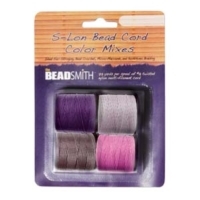 The color assortment contains 4 spools. Each spool is approximately 35 yards. 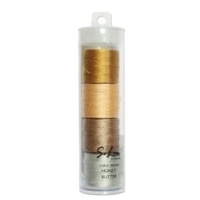 Colors: brown, copper, gold, and bronze. 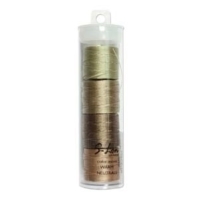 Superlon Heavy Bead Cord is a heavy weight 3-ply twisted #18 bonded nylon multi-filament cording. The cord diameter is approximately 0.9mm. 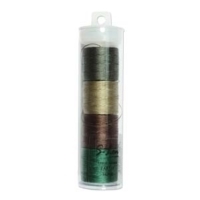 The color assortment contains 4 spools. Each spool is approximately 35 yards. 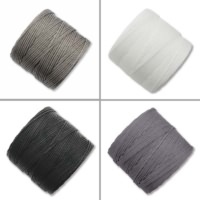 Colors: black, white, light gray,and light khaki. 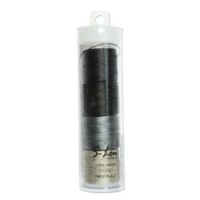 Superlon Heavy Bead Cord is a heavy weight 3-ply twisted #18 bonded nylon multi-filament cording. The cord diameter is approximately 0.9mm. The color assortment contains 4 spools. Each spool is approximately 35 yards. Coral Pink, Light Pink, Light Orchid, Rose Pink. 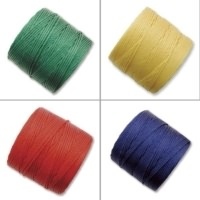 Superlon Bead Cord is a standard weight 3-ply twisted #18 bonded nylon multi-filament cording. 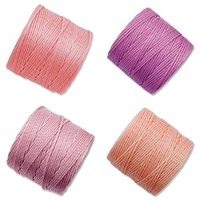 The color assortment contains 4 spools. Each spool is approximately 77 yards. Ice blue, steel, celery green, green blue. 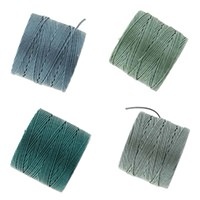 Superlon Bead Cord is a standard weight 3-ply twisted #18 bonded nylon multi-filament cording. 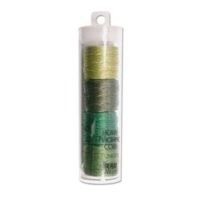 The color assortment contains 4 spools. 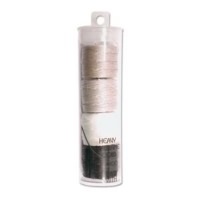 Each spool is approximately 77 yards. Ice Blue, Dark Teal, Hyacinth, Green Blue. 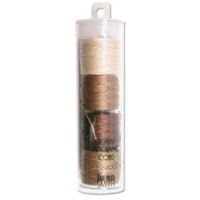 Superlon Bead Cord is a standard weight 3-ply twisted #18 bonded nylon multi-filament cording. 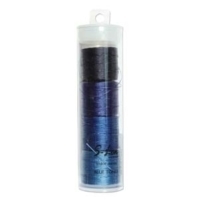 The color assortment contains 4 spools. Each spool is approximately 77 yards. Milk Chocolate, Lemongrass, Avocado, Dark Brown. 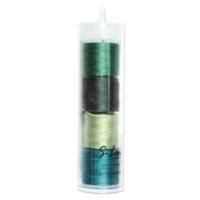 Superlon Bead Cord is a standard weight 3-ply twisted #18 bonded nylon multi-filament cording. The color assortment contains 4 spools. Each spool is approximately 77 yards. Sand, Blush, Sunlight Yellow, Vintage Jade. 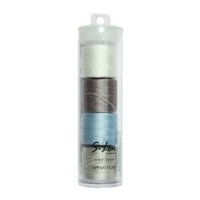 Superlon Bead Cord is a standard weight 3-ply twisted #18 bonded nylon multi-filament cording. 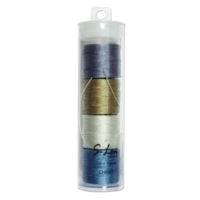 The color assortment contains 4 spools. Each spool is approximately 77 yards. 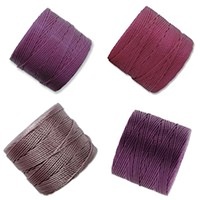 Plum, Wineberry, Winterberry, Dark Lavender Superlon Bead Cord is a standard weight 3-ply twisted #18 bonded nylon multi-filament cording. 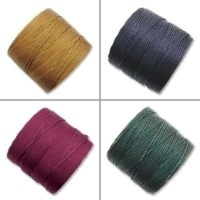 The color assortment contains 4 spools. Each spool is approximately 77 yards. 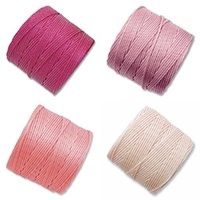 Natural, Magenta, Rose Pink, Light Pink. 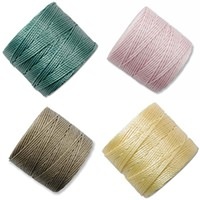 Superlon Bead Cord is a standard weight 3-ply twisted #18 bonded nylon multi-filament cording. 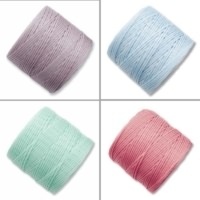 The color assortment contains 4 spools. Each spool is approximately 77 yards.